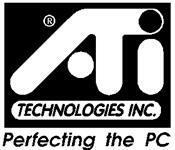 AP_NT_16:ATI Graphic Card Listing - ATI Technologies Inc. Thank you for your inquiry regarding the capabilities and/or hardware configurations of ATI graphics card. On the following pages you will find a set of quick reference charts which list all retail and the most common OEM product names along with some basic information about the capabilities and hardware. Any graphics products introduced before the VGAWonder series. These include CGA/monochrome cards such as the Graphics Solution, EGA cards such as the EGAWonder and the VIP. Motherboard graphics which use ATI chipsets. These designs are not under the control of ATI and therefore we cannot make any representations in regards to them. OEM products which are sold under another vendor's trade name. The listed OEM product names are either generic or products which the vendor publicly made it known that they where manufactured by ATI. The terms of our contract with other vendors prevent us from disclosing their information. The information is accurate to the best of our knowledge at this date. ATI may make changes to listed products or introduce new products at any time without notice. The SVGA, mach8 and mach32 family products have not been shipped for some time and therefore this information can be considered to be stable. The mach64 GX family products are currently in its end of life phase and several products are no longer shipped. It is unlikely that any new products based on the mach64 GX will be introduced. ATI is actively developing additional variants of the mach64 chipset with exciting new functionality. There will be a number of new products and using the new chipsets in existing products over the remainer of the year. Please monitor the ATI BBS, Compuserve Forum. Web site and/or Fax Back service for new product announcements.